Anna in Chanel (what else?) at the Met Gala 2016. Photo by Dimitrios Kambouris. I could not get over how bad most of the fashion was at tonight’s Met Gala, to celebrate the opening of the new exhibit Manus x Machina: Fashion in an Age of Technology. It seemed like most ladies thought they needed to wear silver because the word “technology” had been included in the exhibition title and most of the gowns were either ugly or ridiculous. Some of them were both! My favorite comment of the night on Twitter came from @ImJdolla who wrote, so poetically, “Everybody looks clown #MetGala2016.” I could not stop laughing at his tweet. He was so right! 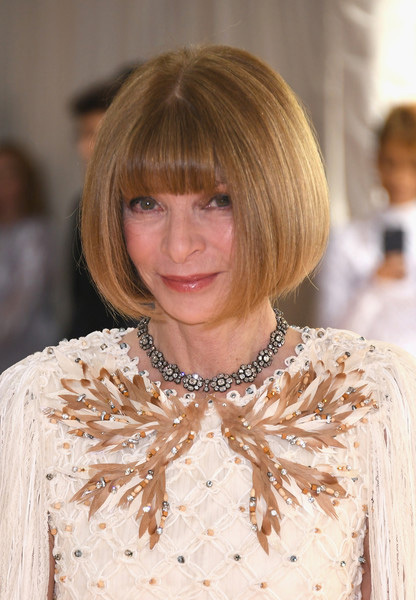 However, this is not a roundup, I only cover what Anna Wintour, Editor-in-Chief of Vogue, wears to this annual event and, of course, as is her tradition, she is in Chanel. I love the moment in the bottom third of the skirt. Photo by Larry Busacca. I do like this off-white column gown on her, particularly the detail at the neckline, as well as the fringe. Once again the wonderful seamstresses at Chanel have shown just how talented they are! I am not sure about the jewelry selections on Anna, however. Why platinum and diamonds when you have so much golden color close to the neckline and so much visual interest to begin with? Why wear a necklace at all? I know there are silver beads throughout the gown but still, the jewelry didn’t make much sense to me. There were so many terrible gowns, however, that even if her jewelry was off, Anna was one of the best dressed of the night. I also like the back of the gown (and the perfect hair). Photo by Larry Busacca. And the fringe at the shoulders instead of sleeves! Photo by Dimitrios Kambouris. I did think Anna’s daughter, Bee Shaffer, looked divine in her black and floral gown by Alexander McQueen. It is one of the only other gowns of the entire night that I thought was pretty! Anna with her daughter Bee. Photo by Dimitrios Kambouris. Let me know what you thought of the dresses on Anna and Bee. If you happened to catch any of the photos of what the other attendees were wearing, feel free to get catty, it was one of the worst red carpets I have ever seen, atrocious from start to finish! What happened? I-m presently well lubricated in Sports Bar celebrating another Cubs win but the Anna frock looks quite nice....and she needn't try and be the belle of the ball as hostess and sensible woman well into her 60s. When I get back to the Den, I'll survey the rest of the field. I love Anna's gown...such a beautiful way to look chic with a touch of trend in the fringe. She looks lovely. I forgot about the Met event...I need to find all the styles on line and enjoy them! Thanks Jill. Awful overall. Chunky boots for a Formal Fashion Event?!?! The too straight matted hair gotta go and take T-Swizzle with you. :-) I haven't had the time to check out the internet today (still working on tomorrow's pearl post). Saw a couple of pics on Instagram and was more or less shocked. Terrible. But I guess there are many attendees thinking better bad headlines than no head lines at all. Anna Wintour's dress is fab. But it's hard to look bad in a dress that was specially made for her. No? And of course her daughter looks beautiful. But that comes as no surprise either. So glad it's not just me who was laughing, Jill! I read the Vogue.com post "Best Dressed at the Met Gala" yesterday while pedaling my exercise bike...and I darned near fell off I was laughing so hard. So many of the dresses were ridiculous. Lady Gaga really made me laugh. But there were more whose names escape me. And then today Vogue.com again...with Kim Kardashian and Kanye West as best dressed couple. More chortling. Anna & Bee look wonderful. The others were a nightmare. Kim in her silver gown looked like a large bag of jiffy pop JUST before it explodes. Kanye in ripped jeans & silver whatever. Does that man ever look happy. Madonna needs a serious intervention before she morphs into a Whatever Happened to Baby Jane character. She is a mom of 4 kids and 2 are youngsters. Beyoncé's peach Latex gown ---Latex?? When I think of latex I think of sweating Yuck!! I guess that are all trying to be outrageous & outdo one another. But they look just awful. Jill, I was so glad to see you thought this was a terrible red carpet. It was a joke this Met Gala. Never have I seen more people trying so hard to look so AWFUL!! Worst of all was Vogue declaring online that Kim K and Kanye were best dressed. Did you see them? I think someone is getting payola for such statements or Anna has finally lost it. Terrible night and I'm writing about British Vogue instead.. A great issue they produced with some swell women. American Vogue is becoming too full of itself with this Met Ball and all....I've lost all respect for it. Loved Bea's McQueen dress, I think it was the best of all. All that embroidery is incredible. Such beautiful workmanship. That 'ball' is becoming a 'hot mess', as they like to say in the South...whatever happened to elegance and beauty? Great post, Jill. I believe that the jewelry could be more modest. The main emphasis was put on the dress. And the selected things only spoil the whole image.